The SIUE East St. Louis Center for Performing Arts, formerly known as the Performing Arts Training Center (PATC), gave a rousing tribute to Dunham on Monday, Oct. 23 that marked the end of the “Katherine Dunham: A Life of Dance, Activism and Anthropology” exhibit. 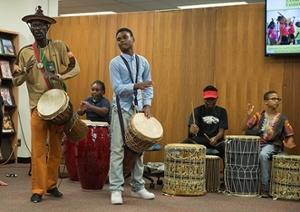 “One of the most significant benefits triggered by the Katherine Dunham exhibit was the performance in Lovejoy Library by the ESLC for the Performing Arts youth and their illustrious instructors,” said Cory Willmott, PhD, associate professor in the Department of Anthropology and curator of the exhibit with Konjit Avent, integrative studies graduate student. Directing students and performing in the program were the following: Jack Williams, ESLC for the Performing Arts program director; Andrea Smythe, former Performing Arts instructor certified in Dunham Technique; and Baba Tunde Sylla (Gerald Williams), Performing Arts instructor and master drummer. “The instructors have committed their careers to a well-held Dunham belief of elevating lives through disciplined training in the arts and humanities,” said Willmott. The ESLC for Performing Arts program is a direct spinoff of PATC that Dunham founded and directed from 1967-1982, according to Willmott. In recent years, lack of funding had shut the program down, but lobbying efforts but the East St. Louis Center secured funding to bring back the Summer Camp in 2015 for children ages 6-17 and then the after-school program in 2016. The year-round performing arts program resurged after a five-year hiatus to offer dance instruction in 2016. 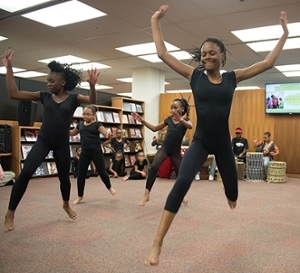 Students and instructors of the SIUE East St. Louis Center for the Performing Arts perform at the Lovejoy Library.